Illusion mini aussies make a wonderful, loving, pet. Miniature Australian Shepherds also are known as the North American Miniature Australian Shepherd. 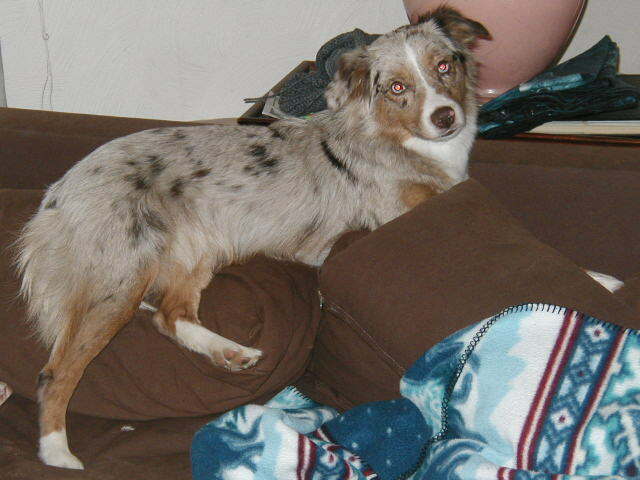 An Ideal mini aussie has the same characteristics of the Australian shepherd, just in a smaller package. They are smart, active, loving, and devoted to their families. They are easily trained, and can do a variety of canine sports, including obediance, flyball, and agility. Most think they are big lapdogs, however they do required mental and physical stimulation. Most are not nearly as active/high strong as most internet sites make them out to be. All of our dogs, are raised in my home. I do not have a kennel. All of the breeding dogs have there eyes and hips checked, and are also DNA checked for PRCD and MDR1. Puppies are eligible to registration at MASCA, NSDR, and/or NAMASCUSA. I strive the breed only healthy, correct, loyal, and intelligent dogs. Spirited enough to compete in any canine sport. Here are some questions that I feel are importan to ask a breeder, my anwsers are under the question. Any breeder you talk to should have the same anwsers, or beware of the potential health problems that could arise. Alot of breeders will say "I have never had a problem so I don't test." This is not a good reason. Health problems can arise anytime, even people can drop dead of a heart attack, and never show a symptom. We are lucky enought to now have DNA testing for genetic problems the can arise later in a dogs life. A1. Yes I health test, Eye CERF yearly, OFA hips after 2yrs, DNA for all possible health problems including PRA and MDR-1. Q2. What kind of health guarantee do you provide on your puppies? A2. I provide a lifetime guarantee on my puppies. no strings attached. Q3 What if I don't want to give up my puppy after a problem has been found? You should not be unhappy with your purchase, and you should have aquired a life long friend, not a life long headache. Yes it means paying a higher price, but in the end you puppies health is worth it.